There's nothing like it getting dark over a cold, grey wet Illinois and waking up in glorious Arkansas sunshine. I'm back in the South – hurrah! Into Texas and we hit Dallas at around 11am. I would have a double seat to myself from now on as Marisa was getting off. We had a whole hour layover so I walked with Arie and Marisa away from the station for a while looking for coffee. Thank heavens for Foursquare, we found a Museum Cafe and started walking towards it. I looked left to cross the road and there was something weirdly familiar about the scene. I ignored it and kept walking but it was bugging me. The I looked up and saw the memorial to George Bannerman Dealey. 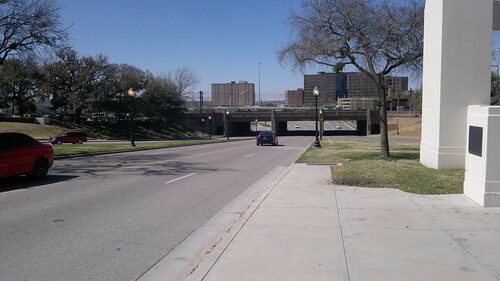 I was in Dealey Plaza. Yes. That's the former Texas School Book Depository Building and hmmmm… that grassy knoll over there… really weird, completely unexpectedly I was walking through a historical site, a place where a man had his brains blown out by an assassin or assassins about a year before I was born. The museum we were heading to had loops of video of that day in November. I didn't know how to feel, I can understand the power of the memory of that President, but commemorating violent death a few yards away from where that violent death took place? I don't know, I still don't. Back on the train and able to stretch out. I was impatient now to get to Austin – we had another 45 minute layover in Fort Worth, just half an hour or so away. I remembered how big Texas is West to East but hadn't quite clicked the North-South dimension too. McGregor, Temple, Taylor no idea where I was just counting down to "Next Stop: Aaaaaaaaaaustin Texasssss"
Finally we were off the train. 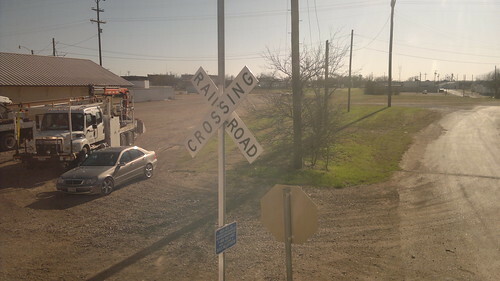 The bizarre thing was that of course this was the same train that I'd caught out of Austin last time I was here. So the light was exactly the same as then (which is where my twitter/FB profile pic was shot) I made a little piece to camera about being back and headed off to stock up at Whole Foods and find beautiful people. 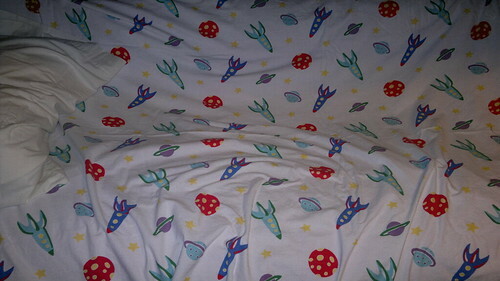 And so to bed, chez @orchid8, in my favourite bottom bunk bed in Austin, with rocket ship sheets – total luxury.